A trial of wireless technology designed to use gaps in the TV spectrum – known as white space – has seen Ofcom team up with ZSL London Zoo to live-stream some of the zoo’s residents. 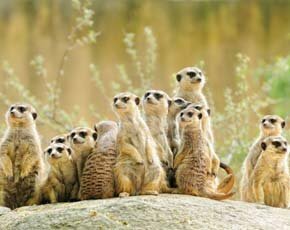 Using innovative hardware from suppliers MediaTek and 6Harmonics, ZSL London Zoo is streaming video of meerkats, giant tortoises and otters to YouTube. The zoo hopes to eventually use wireless video streaming to monitor and protect wild populations of endangered animals. Video will be just one application of white space technology, which Ofcom hopes to give the go-ahead for wider roll-out next year, and other trials are already in progress around the UK. Ofcom believes that successfully exploiting white space could help bring internet access to rural communities, aid in the setting up of machine-to-machine networks for the internet of things (IoT) and provisioning of Wi-Fi-like services. Radio waves used by TV white space devices can travel further and encounter less interference from inanimate objects – such as buildings – when compared to regular Wi-Fi, said Ofcom. In Oxfordshire, the Oxford Flood Network, a citizen-build wireless sensor network that warns local communities of potential flood risks, is working with Love Hz and Nominet to monitor river water levels, with data sent over white space using Adaptrum devices. The University of Strathclyde’s Centre for White Space Communications has teamed up with Microsoft, 6Harmonics, MediaTek, Spectrum Bridge and Sky to explore how triple-band Wi-Fi might enhance internet coverage in public urban locations, and benefit smart city projects. Also in Scotland, CloudNet IT Solutions, Fairspectrum and Carlson Wireless Technologies are testing white space to offer on-board internet to ferry services in Orkney and the Pentland Firth. CloudNet hopes to extend the trial to other ferry operators. Microsoft, Neul and 6Harmonics are also working with Click 4 Internet on the Isle of Wight to provide connectivity with shipping. Ofcom has plans to explore whether the white space in other spectrum bands could be used in the same way. It said that, with growing demand for data in the UK from both enterprises and consumers, it would need to find more ways to free up spectrum for high-speed services, such as that being released by the MoD. “It is essential that we find the most efficient ways to share the airwaves,” said Philip Marnick, group director of Ofcom’s Spectrum Policy Group. “White space technology could be one way of meeting this demand. “These trials are an important first step in understanding whether white space can be used in other spectrum bands.